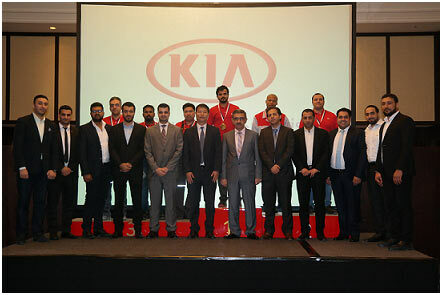 KIA Motors Corporation conducted the 7th Kia Regional Skill Competition at Al Majid Motors Training and Service Facilities in Dubai- UAE. March 2018: Dubai, United Arab Emirates: KIA Motors Corporation conducted the 7th Kia Regional Skill Competition at Al Majid Motors Training and Service Facilities in Dubai- UAE. 16 National Technician skills cup winners from 12 countries in the Middle East and Africa Region battled against each other for the top honor "Kia Technician in the Region“ and chance to participate in the World Skill Cup scheduled for the 2nd quarter of this year in Korea. Motivational programs such as the Technicians Skills Competition encourages technicians to develop their technical knowledge and skills aligned with KMC’s “Fix it Right The First Time attitude” to enable them to deliver the unique service experience for our valuable customers. The competition allows technicians to learn and understand the latest service technologies and exhibit their skill by completing the examinations and diagnosing common faults prepared by the Kia Engineers. Following the whole day of competition, a closing ceremony and dinner was arranged at Roda Al Bustan Hotel were Kia Motors Company Middle East and Africa Regional Headquarters delegates headed by Mr. HR CHO declared and awarded this year's winners of the skill competition. It was a victorious day for Al Majid Motors, when KMC finally closed the competition and officially announced the winners. The Golden medal has been awarded to Al Majid Motors technician who graded as the Best Technician in the Region. Silver medal goes to technicians from South Africa and Egypt finally the bronze medal was awarded to UAE, Iran and Saudi Arabia. The outcome was a result of rigorous and well planned training courses.